Bei CAS-ual Fridays gibt es gerade die Challenge "make your mark"
This is SPECTACULAR!!! What kind of markers did you use? Aaahhh, ich kann es gar nicht glauben, eine ganz ähnliche Karte liegt auf meinem Basteltisch zum Fotografieren bereit! Manchmal erschreckt es mich fast wie sich unsere Kreativität ähnelt! Deine Karte ist auf jeden Fall wunderwunderwunderschön! Awww, it's amazing!!! Love the colours! Whoa! This is incredible! Love your card! Stunning !!!!! The colours and design are just breath taking. WOW, was für ein Farbspektakel!! Der Übergang ist dir wirklich grandios gelungen, und so schöne kräftige Farben - einfach toll! Wow, such a beautiful colorful card! Fantastic rainbow effect. Love it! 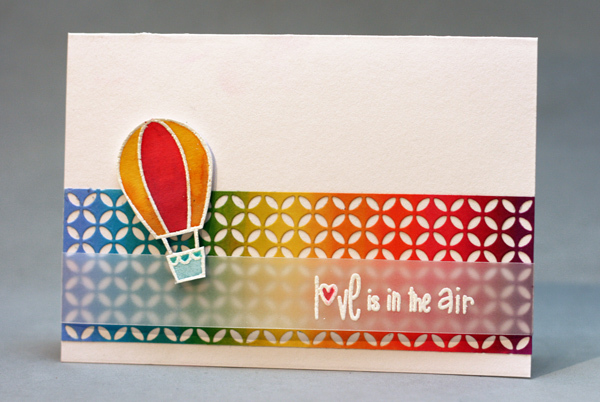 Such a beautiful card...I love how you created a color gradient with your markers...so pretty! Fantastic! I love that strip of vellum and all the wonderful colors. Thanks so much for playing with us at CAS-ual Fridays! Fantastic! This brightens my day! Beautiful use of color...wonderful card!! So glad you joined the challenge this week at CAS-ual Fridays...love seeing your creativity in the gallery:)! Wow. This is the winner in my book! Wow. Congrats on your VIP win over at CAS-ual Fridays! Wooohoo! Tolle Werke wie immer! Congrats on your VIP win over CAS-ual Fridays!